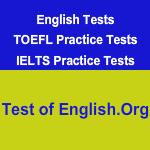 What is the hardest part of the TOEFL test? Most people will agree that it is the Listening section. And that is hardly surprising. Students who have grown up in countries where English is not the first language have difficulty understanding the various accents with which English is spoken. What’s more the listening section of the TOEFL iBT is full of long talks which are quite hard to understand. Why good listening skills are important? Having good English listening skills is essential for ‘surviving’ on an American campus. If you have difficulty understanding spoken English, your chances of doing well in an English classroom are slim. That’s why ETS has made listening an integral part of the TOEFL test. Why listening is the hardest part of the TOEFL test? The TOEFL listening test is hard because it uses complex vocabulary. It is full of long talks or lectures which are supposed to simulate the real lectures you could hear in a class room in an American university. These long talks could last for several minutes and may consist of difficult vocabulary. Worse still, students are not allowed to take notes while listening. And since the talks are very long, they often find it difficult to understand what was said in the beginning. So the question is: how can you raise your score in the TOEFL listening section? The best way to improve your English listening skills is to live in a country where English is spoken as the primary language. For most students this is hardly possible. They are coming from countries where English is the second or third language. If you can’t go to the US or Canada to improve your listening skills, you should try other proven methods. Do you have native English speakers among your friends? If so, listen to them as they talk. This is one of the most practical ways of improving your listening skills. If you can’t find native English speakers to listen to, watch English films and television programs. Many TOEFL students would testify that this is a very effective technique. Turn off the subtitles when you watch English films. Of course, in the beginning you will hardly understand a word. But if you try this over a period of time, your listening skills will improve. Watch American news programs and documentaries such as the CNN and 60 minutes. These are similar to the kind of talks you will hear during the real TOEFL test.